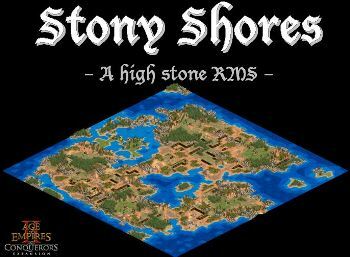 Stony Shores is a random map script that has lots of hills, cliffs, craters, rocks, and lots of stone you can mine. All this stone comes at a price though - it's difficult to find enough building space because of all the hills, cliffs and rocks. Also, trees don't grow well in stony soil (which is unfortunate, considering that it may well be a good idea to build a fleet). I've stuffed this map with eye-candy, and lots of varied terrains. Building space can be very limited on this map. With v2 IÃ¢ï¿½ï¿½ve tried to address this problem by scaling back the amount of eye-candy. AIs generally do ok on this map. This looks like a good map! · Less Tree I and H (if I remember correctly, those are the black and brown dead ones). They look all the same and make the map look unnatural. · Less clumped rocks, better spread them out (and use beach as base terrain). -For the black and brown trees, I can certainly reduce the frequency of those. -Rock clumping - I'm not sure lots of individual rocks is really preferable to large clumps, but perhaps ... I will try it and see what it looks like. -Use beach as a base terrain (for the rocks). About that, I've done it partially already, hence all the beaches that do have rocks on them. I think what you are getting at is that there are too many rocks that aren't on beaches and are filling up the rest of the map too much, and you're probably right about that.